TP Vision, the company well known for selling televisions under the Philips brand, at IFA 2016 launched the brand’s first 4K Oled television, complete with its iconic Ambilight Technology. Philips 55-inch 901F television comes with Perfect Pixel Ultra HD engine and produces superior black levels that most of the others, the company said in its release. The Perfect Pixel Ultra HD engine has the processing power of 4 billion pixels that allows the system to continually monitor and adjust each individual pixel for sharpness and brightness, the company said in its release. 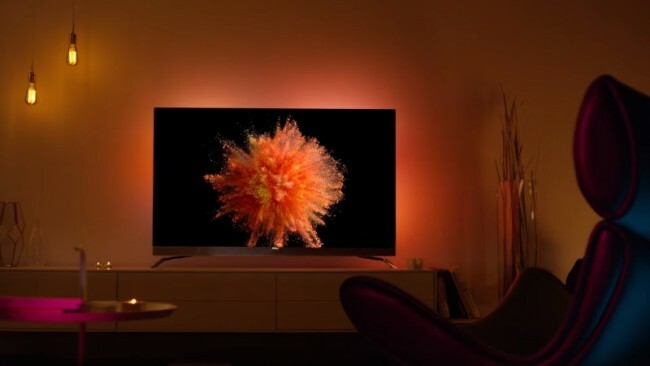 With the Philips Ambilight technology, the television produces lights from its three sides in accordance with the colours on the screen. The television comes with Android Smart TV system and gives you access to all TV oriented apps, services, and content from Google Play. The pricing and the availability for the television has not been disclosed by the company yet. Alongside the Philips 901F TV, the brand also unveiled a lighting product at IFA that seems like a work of science fiction or even magic. Philips Hue motion sensor detects the movements made by the people inside the house and according to the time of day, it ensures that there is appropriate lighting for you to move around in the house. The Philips Hue products could already be controlled by voice commands as well as your smart device and wearables. The company also announced Fidelio B8 Soundbar with Dolby Atmos, which features a network of 18 speakers and aims to make a home theatre at your own home. “By combining Philips’ proprietary Ambisound technology, the B8 Soundbar delivers full 5.1.2 surround sound from forward firing speakers,” the company said in its press release. Philips Fidelio B8 Soundbar will be made available in October at an expected retail price of EUR 999 (roughly Rs. 74,700). In case you prefer to carry your music with you, the company has you covered with its Philips PixelPop Bluetooth speakers that company claims deliver big bass and clarity of sound. The Bluetooth speakers are also water resistant so that you don’t have to worry while carrying them to pool. The expected retail price for Philips PixelPop is EUR 39 (roughly Rs. 2,900).